The Siemens 1.5T Symphony Mobile MRI system is a compact, full-body MRI featuring an ultra-short, 60cm bore. Able to comfortably fit most patients, and with a set of matrix coils that can flexibly combine up to 76 coil elements, the Siemens 1.5T Symphony MRI boasts unlimited parallel imaging. Moreover, this MRI optimizes any imaging needs through its syngo SPACE technology, which allows physicians to see very small details in a single 3D image.The Siemens 1.5T Symphony MRI is available in an 18- or 32-channel configuration, and it has additional inline processing such as Inline Diffusion for automated ADC mapping. This combination of technology and innovations makes the Symphony mobile MRI an optimal choice for its patient-friendliness and fast scanning capabilities. 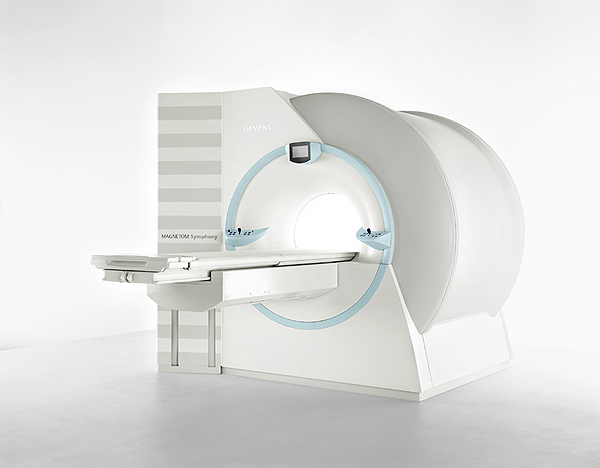 The Siemens Magnetom Symphony 1.5 Tesla MR machine is a popular, affordable MRI scanner. Its short bore allows it to fit in tight rooms or where a compact MRI is a more effective solution.